The Best OUTER THIGH WORKOUT for Getting Rid of SADDLEBAGS! This leg workout targets a trouble zone for many women – your thighs! 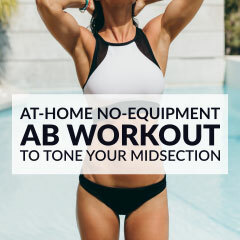 Saddlebags are quite tricky to treat, but if you pair these 10 outer thigh exercises with a healthy eating plan and plenty of cardio, you’ll be saying adios to this trouble zone in no time! Start this outer thigh workout with a 10 minute warm up. 1. Squat side kick: 45 seconds. Start in a squat position with your hips back and your feet shoulder-width apart. As you stand up switch your weight to the right leg and lift your left leg out to the side. Return to the squat position and repeat with the right leg. 2. Side plank hip abduction: 30 seconds + 30 seconds. Start in a modified side plank position, with your top leg extended and your bottom leg bent back. Lift your top leg as high as possible and then lower it back down. Repeat for 30 seconds and then switch sides. 3. Standing open the gate: 30 seconds + 30 seconds. Stand with your feet hip-width apart and place your hands at the waist. Lift your left knee up to waist level and then move it out to the side. Return to the starting position and repeat for 30 seconds. Switch legs and repeat. 4. Clamshell: 30 seconds + 30 seconds. Place a resistance band around both thighs, lie on your side with your knees slightly bent and place one leg on top of the other. Keep your feet together and lift your top knee until it’s parallel with the hip. Lower your knee back to the initial position, repeat for 30 seconds, and then switch sides. 5. Curtsy lunge: 45 seconds. Stand tall with your feet hip-width apart. Take a big step back with your left leg, crossing it behind your right leg. Start lowering your body, by bending your knees, until your right thigh is parallel to the floor. Return to the starting position and repeat on the opposite side. 6. Fire hydrant: 30 seconds + 30 seconds. Get down on your hands and knees, with your wrists under your shoulders and your knees hip-width apart. While keeping the knee bent, raise one leg up and out to the side, until it’s level with your hip. Return to the starting position, repeat for 30 seconds, and then switch legs. 7. Quick feet: 45 seconds. Start in an athletic position with your feet shoulder-width apart and your hips low. Push through the balls of your feet and run in place quickly. 8. Circles in the sky: 30 seconds + 30 seconds. Lie on your back with your legs extended and your hands supporting your head. Raise your shoulders off the floor, lift your right leg to a 90-degree angle, and raise your left leg only a few inches from the floor. Slowly rotate your right leg, making small clockwise circles, for 30 seconds. Lower both legs, switch sides and repeat. 9. Skaters: 45 seconds. Lean forward, jump to the right, bring your left foot behind you, and bring your left arm in front of you. Jump to the left, bring your right arm in front of you and your right foot behind you. Repeat this side to side movement for 45 seconds. 10. Single leg bridge: 30 seconds + 30 seconds. Lie on your back with your arms by your sides, knees bent and feet flat on the floor. Raise one leg and lift your hips as high as you can. Lower your hips, repeat for 30 seconds and then switch legs. Finish this outer thigh workout with a thorough stretching routine.